This page provides two charts that plot the quality ranks of 5 Europe-based and 5 Japan-based automobile manufacturers - Daimler, Volvo, BMW AG, Volkswagen AG, Saab, Toyota Motor Corporation, Honda Motor Company, Fuji Heavy Industries Ltd., and Mazda Motor Corporation. Each chart employs a different method for computing the quality rank of the manufacturers. 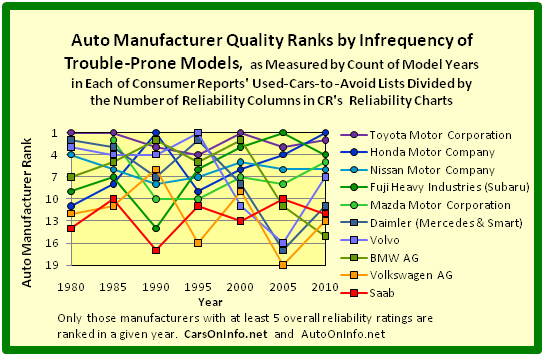 The first graph provides the ranks of the above 10 car makers based on each manufacturer's infrequency of trouble-prone models. These ranks provide a measure of how well each manufacturer's models successfully avoided the bottom end of the model-quality spectrum for the years 1980, 1985, 1990, 1995, 2000, 2005, and 2010. 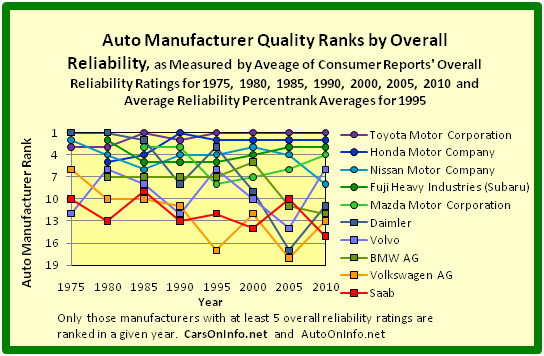 The second graph provides the ranks of the above 10 car makers based on the average of the overall reliability ratings of each manufacturer's models. The second ranking provides a measure of how well a manufacturer's models performed over the entire model-quality spectrum in each of the years 1975, 1980, 1985, 1990, 1995, 2000, 2005, and 2010. The quality ranks of the above 10 automobile manufacturers by these computations are given for each of the above years in the first graph below. The quality ranks of the above 10 car manufacturers by this set of computations are given in the second graph below. 1. By the quality ranking based on the infrequency of trouble-prone models, the 5 European auto manufacturers intermingled with the 5 Japanese auto manufacturers in 1980 and 1985, although on average the Europen car makers fell below the Japanese car makers even in these earlier years. However, by 2005 and 2010, there was a complete separation, with the quality of all of the Europe-based manufacturers falling below that of the Japan-based manufacturers. 2. By overall reliability, a rather similar separation occurred, as most of the Europe-based manufacturers fell by this quality rating as well. An exception to the general European decline is Volvo, which has moved rather helter-skelter about the quality spectrum, but never placing particularly highly.